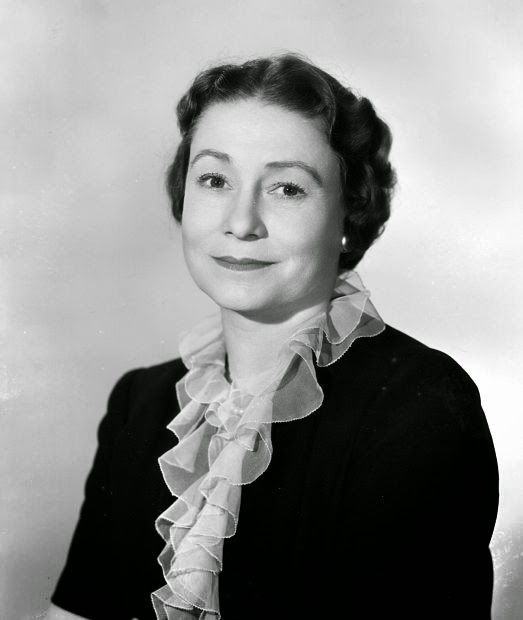 Josephine Hull won the 1950 Best Supporting Actress Academy Award for her role in Harvey. 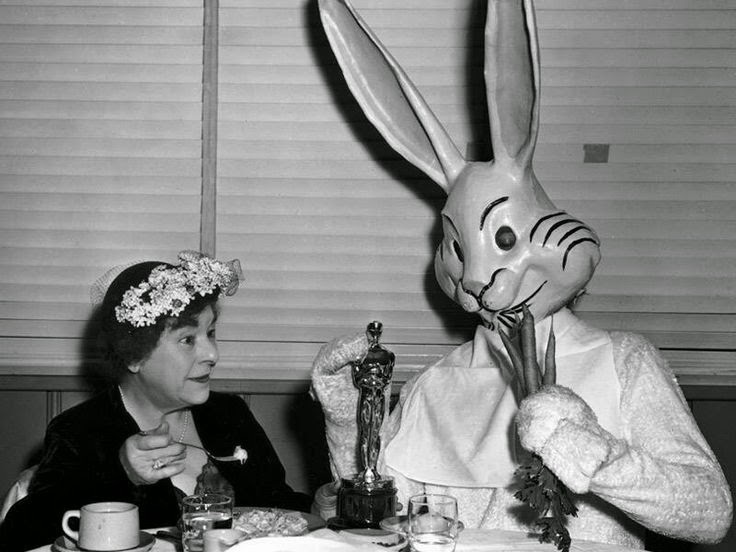 Here she is showing off her newly minted Oscar to a certain large white rabbit. Like many of the other categories at the 1950 Academy Awards, best supporting actress was dominated by All About Eve with both Thelma Ritter and Celeste Holm receiving nominations for their memorable turns in the witty drama. 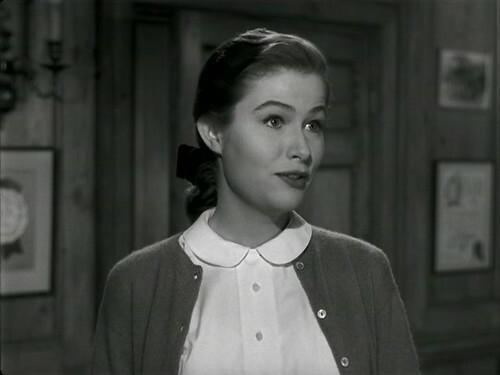 The other nominees were Hope Emerson, who played a sadistic women’s prison guard in Caged and Nancy Olson, who played an up-and-coming script reader in Sunset Boulevard. 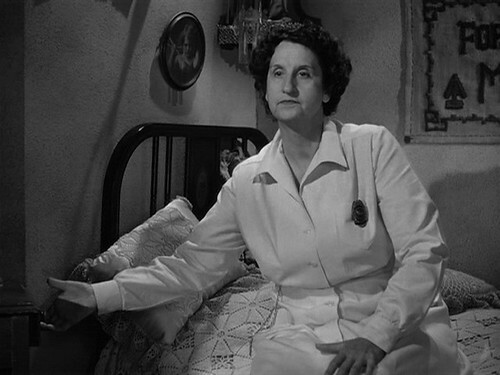 In the end, the Oscar went to veteran character actress Josephine Hull for her hilarious turn in Harvey as James Stewart’s exasperated sister. Here she is receiving her Oscar from Dean Jagger and Fred Astaire. She gives a gracious and funny acceptance and her outfit is the height of early fifties glam. Hull was a veteran character actress who mostly appeared on Broadway. She was known for playing fussy matrons in plays like You Can’t Take It With You (Spring Byington played the role in the 1938 film) and Arsenic and Old Lace (Hull reprised her Broadway success in the 1944 film). She played Elwood P. Dowd’s flighty sister in Harvey for six years on Broadway before reprising her role for the film starring James Stewart. Hull’s performance isn’t the most complex in the group (that honor goes to both Emerson and Holm), but she gives a fine, funny performance as a woman who is truly exasperated by her brother’s preoccupation with an imaginary 6-foot, 4-inch rabbit. Holm was a well-respected dramatic actress and an Oscar winner (1947 best supporting actress for Gentleman’s Agreement) by the time she played wronged wife, Karen Richards, in All About Eve. Holm’s performance isn’t as showy as many others in Eve’s cast (this and vote-splitting with Ritter probably lost her the Academy Award), but she is quietly effective as a woman who is thrown into the high drama and difficult personalities of the theatrical world through her marriage to a successful playwright (Hugh Marlowe). Holm is in many ways the most sympathetic character in All About Eve and her reactions -- affectionately bemused at Margo’s (Bette Davis) antics; outraged by Eve’s (Anne Baxter) wily manipulations -- mirror those of the audience. Before there was Orange Is the New Black, there was Caged, and the 1950 women’s prison drama was a sensational highlight for fifties moviegoers. Caged was filled with exceptional performances (Eleanor Parker earned a best actress nomination for playing a pregnant widow who lands in the big house), but the standout performance in Caged is Emerson as a sadistic prison guard. She probably should have won the Oscar, but voters went with a safe choice with Hull, rather than reward Emerson’s daring performance. Olson rounded out Sunset Boulevard’s stellar cast with an excellent performance as an up-and-coming script reader who falls for the wrong man (in this case a self-loathing screenwriter played by William Holden). Olson is probably the most easily overlooked of the Sunset Boulevard cast (it’s hard to standout with Midwestern nice when you’re competing with a boatload of over-the-top crazy), but she strikes just the right notes as Betty Schaefer. Betty is Joe’s dream girl precisely because she is so unlike the flamboyant, needy and demanding Norma Desmond (Gloria Swanson). Betty is without a doubt the best performance of Olson’s career. Her final scene, where she discovers exactly how Joe has been affording all those fancy suits and expensive cigarette cases, is a truly fine piece of acting. Ritter is well-known today for her many, many roles as maids in old Hollywood films, but her turn as Birdie in All About Eve was her breakthrough role. Ritter had appeared in bit parts in films like Miracle on 34th Street (1947), but writer and diretor Joseph L. Mankiewicz gave Ritter her big break in All About Eve as Margo Channing’s wisecracking assistant. 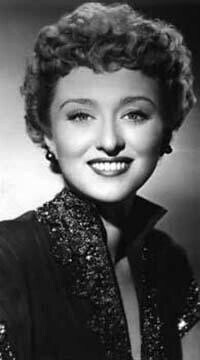 Ritter doesn’t have a very large part (at least compared to Celeste Holm), but she makes the most of her limited screen time, offering memorable wisecracks in her trademark Brooklyn accent. Birdie is the only character shrewd enough to immediately recognize Eve’s deceptive nature: “She’s got everything but the bloodhounds nipping at her rear-end” is Birdie’s perceptive reaction to one of Eve’s elaborate sob stories. Go here, for more about the 1950 Oscars.